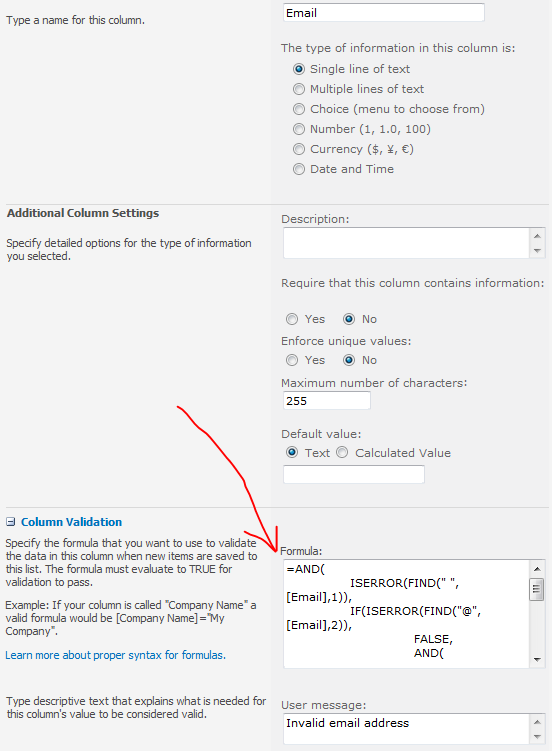 HI, I’ve tried to use your formula in the column settings on a Office365 environment, and it doesn’t work. Get an error message when trying to save. works superb. love ur solution. :).Saved my day. Awesome!!!! That really works!!! Thank you!!! How could I alter this to ensure that email addresses are all from a specific domain (ie: @gmail.com)? This actually works fine in excel, but I can’t seem to make it work in SharePoint. Is there anything that I may have missed? I greatly appreciate your help. Thank you! Thank you, just what I needed and worked PERFECTLY. Thanks a lot this worked Perfectly, And below is how you can use this in Field Definition.